The freshly picked Long Mountain cherry is processed the day it is picked, before the very ripe fruit has a chance to degrade or sour. Cranberry sized fruit is run though an antique belt driven pulper, which removes the skin and part of the pulp around the bean. It is fermented for a day, removing the remaining pulp and developing the bean flavor. 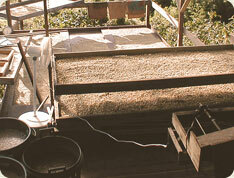 A water bath stops the fermentation process and the beans are spread out on a deck to dry in the Kona sunshine. This drying can take several weeks depending on weather and the beans are raked many times a day to ensure uniform moisture content. The beans, now called parchment due to their color and texture, are then bagged and stored in a climate controlled room, to further age and mellow. 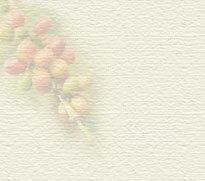 Before the Kona beans can be roasted they are further milled to remove the dry outer layers. The resulting green beans are then sorted and graded by shape and size, with cracked, discolored, small and misshapen beans discarded.